Beauty. Rarity. Durability. Discover the attributes that attract us to colored gemstones for personal adornment and make gemstones valuable and precious. Colored gemstones provide the opportunity for uniquely personal expression. Use Jewelers of America’s guide to buying gemstone jewelry to ensure you select the highest quality gemstone jewelry for your budget. Gem cutters work to achieve a pleasing and affordable mix of color, weight and a safe shape for mounting. During creation, a gemstone’s size is constrained by nature. For example, while large and beautiful amethysts are readily available, an alexandrite of large size is extremely rare. Sparkle adds to the beauty of a well-cut colored gemstone. The cut of a colored gemstone describes its shape and how it is fashioned. Some gemstones, such as opal, are suited to a smooth, rounded surface. Others, such as sapphire, are more frequently shaped with a precise series of flat, symmetrical planes, called facets, which make the most pleasing illumination of the gem’s color. Some cutters today may also use convex or concave facets, shaping colored gemstone like small sculptures. Emerald gemstones have been beloved throughout human history, evoking rebirth, renewal and spring. The word “emerald” comes from the Greek word “smaragdos,” which means green stone. Variations of its rich color suggest soothing, lush green gardens. The Roman Emperor Nero is said to have used slices of emerald placed before his eyes to view gladiator fights. Emerald is the May birthstone, and it is the gemstone for 20th wedding anniversaries. Emerald is a variety of the beryl species and is related to aquamarine and green beryl. The first known emerald mines were in Egypt. 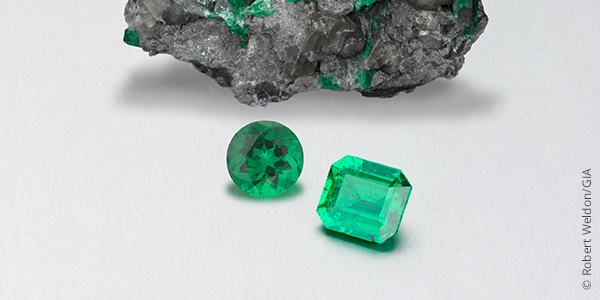 Colombia has been a leading source for emerald for centuries. Other sources are Afghanistan, Brazil, China, Madagascar, Russia, Zambia and Zimbabwe. Emerald gemstones have also been found in North America in Hidden, North Carolina, and the Yukon Territories in Canada among other locations. Emerald has a hardness of 7.5-8.0 on the Mohs Hardness Scale. Emerald is the only stone with a cut named after it. Fractures often occur in emeralds and some treatments have been developed to diminish the appearance of these fractures, improve the color and increase the transparency of the gem. These treatments include filling fractures with oil, paraffin, resins or polymers. Any treatments should be disclosed to the buyer. Reclaim the future for millions! Join our team for the Alzheimer’s Association Walk to End Alzheimer’s®, the nation’s largest event to raise awareness and funds to fight Alzheimer’s disease. Together, we can advance research to treat and prevent Alzheimer’s, and provide programs and support to improve the lives of millions of affected Americans. The woman in this picture is Estelle or some of you might know her as Mom. 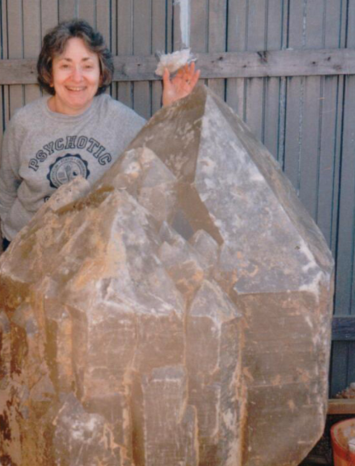 Estelle helped her son with bookkeeping and other various tasks for the business, Gary’s Gem Garden. Gary’s Mother retired from the store only to be diagnosed with Alzheimer’s shortly there after. A long and very difficult disease for the whole family. She passed on June 14, 2015. Bring your pearls and necklaces to Gary’s Gem Garden for the best in necklace repair! We do professional knotting and straight stringing. We do costume jewelry repair as well. Pearls have been a source of fascination and desire since ancient times. Viewed as magic charms, symbols of purity and love, or sources of wisdom and power, pearls are one of the oldest known gems and have been revered by countless civilizations. Legend has it that Cleopatra dissolved a large pearl in a glass of wine and drank it to impress Marc Antony with her wealth and power – a ploy that worked all too well. Knights in the Middle Ages wore pearls onto the battlefield to protect themselves from harm. Queen Elizabeth I so loved the white gems that she had them sewn on all her clothing and wore ropes of them around her neck. In addition to their fascinating beauty, pearls occupy a unique spot in the world of precious gemstones. Instead of being found in a core of rock, a pearl is made over time by a living creature, an oyster. Today, cultured pearls combine the beauty of nature with the genius of man to create organic gems available in a wide array of styles and prices. The cultured pearl begins its life as an irritant to the oyster. To protect itself, the oyster coats an intruding object or grain of sand with nacre, a crystalline substance that builds up over time, resulting in a shimmering, iridescent creation. The culturing process developed by man mimics nature. Farmers implant a fine bead into the oyster where it cannot be expelled. The oyster does the rest and creates its lustrous masterpiece, the cultured pearl. Akoya This is the most familiar type of cultured pearl sold in necklaces. Akoyas from Japan and China are grown in pearl oysters and are known for their shimmering beauty and warm colors, which range from rose, cream and gold to silvery white and blue/gray. South Sea Large (10mm and up) cultured pearls grown in tropical and semi-tropical oysters in the South Seas and around the coast of Australia. Their color ranges from silvery white to gold. They are quite costly due to their size and rarity. Tahitian Black Large (10mm and up) cultured pearls grown in black-lipped oysters in French Polynesia. Colors range from silvery gray and green to deep purple and black. Their large sizes and unique colors command premium prices. Mabe Large, hemispherical cultured pearls grown against the inside shells of oysters rather than in the oysters’ bodies. Due to their half-round shape, they are most popular in earrings, rings and brooches. Mabe cultured pearls are less expensive than round cultured pearls. Freshwater Pearls cultivated in mussels, not oysters, in freshwater lakes and rivers primarily in China, Japan and the United States. Shapes can be freeform, rice shaped, off-round or spherical, and colors range from milky white to peach, pink and lavender. Freshwaters can be less expensive than other varieties of cultured pearls. Keshi Also known as seed pearls, these tiny cultured pearls can be as small as a grain of sand and form accidentally in many cultured pearl oysters. Gold, one of the world’s most precious metals, dates back to the dawn of mankind. All great civilizations built up treasuries of the lustrous metal, reserving golden objects for their most important rituals. The most alluring use of the sun-colored metal has always been in jewelry. The Egyptians, largest producers of gold in the ancient world, equated gold with the sun, the giver of life, and reserved its use for pharaohs only. The ancient Etruscans created meticulously hand-wrought objects using fine granules and threads of gold, a technique still practiced today. To this day, Chinese and Indian brides wear jewelry of 24-karat gold on their wedding day to ensure a lifetime of good luck and happiness. A gift of gold jewelry says love and permanence as eloquently today as in all the ages past. Beauty. Gold’s natural color can be further enhanced by alloying it with small amounts of other metals, yielding a spectrum of exquisite, subtle shades. Metalsmiths are able to create yellow, rose, green and white golds by adjusting the alloys. More copper results in a soft rose color; additional silver creates green gold; and nickel produces white. A popular trend is to combine two or more colors of gold in a single piece of jewelry. Purity It is estimated that only slightly more than 100,000 tons of gold have been taken from the earth during all of recorded history. And although gold can be found in rivers, seas and land in many parts of the earth, it is not easily extracted. Opening a mine is a time-consuming and costly operation, and several tons of ore are required in order to produce just one ounce of the precious metal. Durability Look no further than the nearest museum, where gold jewelry, coins and artifacts from ancient civilizations attest to the metal’s enduring beauty and permanence. Workability Jewelers throughout the ages have preferred gold to all other metals for its beauty and ease of workmanship. Gold can be melted, or shaped, to create any design. It can be alloyed with a number of other metals to increase its strength and produce a variety of colors and can be re-melted and used again to create new designs. Beauty. Rarity. Durability. These attributes attract us to colored gemstones for personal adornment and make gemstones valuable and precious. Colored gemstones provide the opportunity for uniquely personal expression. Beauty. Most colored gemstones derive their beauty from their color purples, blues, greens, yellows, oranges, reds. In certain colored gemstones color occurs naturally. Satisfying hues are intrinsic in some garnets, for example. In other colored gemstones, the final color occurs with assistance. For nearly as long as people have worn rubies, we have known how to treat a rough ruby with heat to obtain a desirable red color. Not all rubies are heat treated, but the vast majority are. Gem cutters work to achieve a pleasing and affordable mix of color, weight (measured in carats), and a safe shape for mounting. During creation, a gemstones size is constrained by nature. For example, while large and beautiful amethysts are readily available, an alexandrite of large size is extremely rare. Sparkle adds to the beauty of a well-cut colored gemstone. The cut of a colored gemstone describes its shape and how it is fashioned. Some gemstones, such as opal, are suited to a smooth, rounded surface. Others, such as sapphire, are more frequently shaped with a precise series of flat, symmetrical planes, called facets, which make the most pleasing illumination of the gems color. Some cutters today may also use convex or concave facets, shaping colored gemstone like small sculptures. The clarity of colored gemstones contributes to their beauty. Unless a gemstone is opaque and blocks all light, how light moves through the gemstone affects its beauty. Some gemstones have few internal inclusions to interrupt the passage of light, as is the case with most pieces of Tanzanite. Others have characteristic inclusions. For example, some emerald has a jardine (garden), which makes each gem truly unique. Rarity. Across time and cultures, people have adorned themselves with rare gem materials. From pearls and corals plucked from the seas, to bright colored pebbles found in the soils settling at the mouths of rivers; from the collection of gemstones mounted in the breastplate of Aaron as accounted in ancient scripture, to the historic gemstones mounted in the crown jewels of European monarchs, we let ourselves be known through the gemstones we choose to wear. These gemstones are precious because they are rare. ​Fine jewelry is a precious possession that is designed and crafted to last a lifetime. However, proper care is required to assure the lasting qualities of your jewelry. Jewelers of America is pleased to offer simple guidelines for the care and cleaning of your fine jewelry. Store your jewelry in a clean, dry place. Keep your jewelry in a fabric-lined jewelry case, or in a box with compartments and dividers. If you prefer to use ordinary boxes, wrap each piece individually in soft tissue paper. Don’t jumble your jewelry pieces in a drawer or jewelry case. Pieces can scratch each other. Clean your diamonds regularly using a commercial jewelry cleaner, a mix of ammonia and water, or a mild detergent. Dip the jewelry into the solution and use a soft brush to dislodge dust or dirt from under the setting. Always thoroughly rinse and dry your jewelry after cleaning and before storage. Avoid touching your clean diamonds with your fingers. Handle clean jewelry by its edges. After wearing, wipe your precious gemstone jewelry thoroughly with a clean, soft, slightly damp cloth. This will enhance the luster of the gemstones and ensure that your jewelry is clean before storage. Store gemstone pieces individually in soft pouches. You should be able to obtain these from your jeweler. Do not expose your precious gemstone pieces to saltwater or harsh chemicals, such as chlorine or detergents. These chemicals may slowly erode the finish and polish of gemstones. Hair spray, perfume and perspiration may cause jewelry to become dull. Apply all cosmetics, perfumes and colognes before putting on colored gemstone jewelry. Make sure to wipe your gemstones after wear to remove any chemicals, oils or perspiration. Aquamarine gemstones evoke the colors of the sea. Aquamarine can be blue, very slightly greenish blue, greenish blue, very strongly greenish blue, or green-blue. Aquamarine gemstones are often free from inclusions and clear as water too, symbolizing purity of spirit and soul. They make fantastic gemstones for evening wear because they glitter and gleam even under muted light conditions. During the day or in bright light, they exhibit a soothing coolness. Aquamarines are found on most continents. Aquamarine is the March birthstone, but anyone can wear and delight in the optical qualities of this gemstone. Aquamarine belongs to the beryl species of mineral and is closely related to emerald, morganite and golden beryl, among others. Brazil is an important source for aquamarine. Other sources include Afghanistan, Burma (Myanmar), China, Kenya, Madagascar, Mozambique, Ukraine and the United States. Aquamarine is a fairly durable gemstone with a hardness of 7.5-8.0 on the Mohs Hardness Scale. Aquamarine gemstones can be cut into many shapes and sizes. Some are cut as cabochons or fashioned into beads. Larger specimens may be carved into gem sculptures. Nature produces a variety known as cat’s-eye aquamarine, a rare, highly collectible, phenomenal variety. Microscopic growth tube inclusions cause the cat’s-eye effect. Aquamarines are almost always heat-treated to lessen the subtle yellow color that occurs in some of them. Any treatments should be disclosed to buyers. Aquamarine can also be man-made, meaning it is manufactured in a lab rather than mined, but it is more often imitated by treated blue topaz, glass and synthetic blue spinel. This should be understood by the seller and clearly disclosed to the buyer. To minimize scratching and wear, store each piece of fine jewelry separately in a soft cloth or padded container. Aquamarine jewelry is best cleaned with warm, sudsy water and a tightly woven microfiber or other soft cloth. Take all your fine jewelry to a professional jeweler at least twice a year for a thorough cleaning and inspection. See our full guide to jewelry care and cleaning. Content © GIA. Image © Robert Weldon/GIA Written by Jewelers of America.